It’s short, it’s pithy, it’s Bible, it’s true. 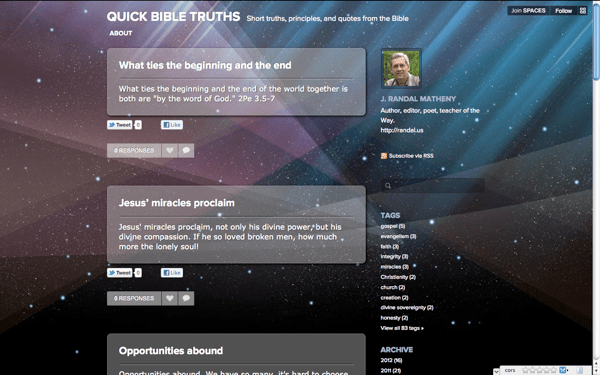 Quick Bible Truths is great for personal edification, for church bulletin zingers, for posting on the Internet. You can sign up to the website by RSS or by following the site and getting QBT by email. Designed for Twitter’s 140-character limit, QBT also offers its truths through WordPress and Facebook. So you can follow it in whatever medium you prefer. Please share with your friends and Christian family through newsletters, email lists, and bulletins. This entry was posted in Websites and tagged Bible, Christian websites, wisdom on 2012-02-15 by J. Randal Matheny.